"After graduating from Grove City College, Harton moved to State College. "He got his start learning to play piano at the age of seven and gained enthusiasm for his main instrument, the organ, as a teenager. He was encouraged by a solid high school music program and later minored in music at college. The musicians he cites as major influences are diverse, from Garth Hudson of The Band to jazz organist Jimmy Smith. "Like most artists, he has a day job, but he's had many great musical opportunities since he began playing in State College professionally in May of 1994. 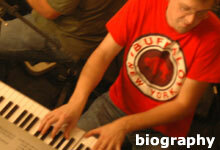 He has worked steadily since moving here in 1994 and is now known as one of the area's 'go to guys' for keyboards. (He is also skilled in playing the flute, saxophone and bassoon.) His first area band was "Busload of Faith," and he most recently played with Dawn Kinnard, traveling with her as far as the Netherlands. "Some other noteworthy local artists and bands he has performed with include The Four Horsemen, Kris Kehr and Veinmelter, among others. He has also spent time in the studio with The Youngers, The Asher Kahn Band and John Cunningham, to name just a few. "The 'Reverend' James Harton got his title when a friend left a message on his answering machine calling him the 'The Rev.' The nickname stuck so he made it official by obtaining a mail order ordination."